Ponta began life in 1901 as "Donaho." When it was bypassed by the Texas and New Orleans Railroad, another town was soon surveyed. Named "Hubb" after the surveyor Hubbard Guinn, storekeeper Robert Montgomery changed the name to the Latin word for bridge when he becme postmaster in 1903. Mr. Mongomery had moved his business from Donaho and had a vested interest in the community's future. Although the name was Latin, the watercourse was still over Mud Creek. Ponta got a bank and before long it developed all the essential businesses for an up-and-coming town. They even had a doctor and a Masonic Lodge. Like the rest of East Texas, timber was the major economic engine until the twenties when people started noticing the forests rapidly being depleted. The town lost its post office in 1972 and a decline set in. The bank failed and the cotton gin closed. Both the doctor and druggist died and even the Masonic lodge moved (to New Summerfield). In the1980s, Ponta only had two churches and a few houses left from its glory days. The population has been given as 50 since 1970. 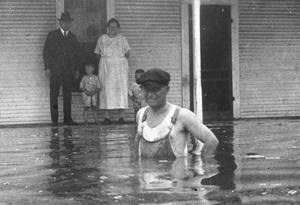 Anyone wishing to share history or photos of Ponta, Texas, please contact us.